Russia’s Internet revenues, driven by burgeoning e-commerce and online payments systems, are rising by 30 percent a year. 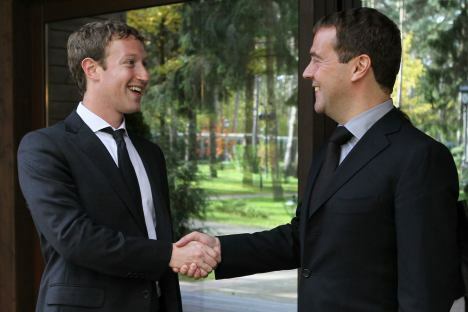 When Mark Zuckerberg came to Moscow, he posed for goofy photos with Russia’s tech-savvy prime minister, Dmitry Medvedev, and posted smiley Facebook updates from Red Square. But his mission was deadly serious: to try to dent Facebook’s local rival VKontakte’s four-to-one lead in the Russian market, and possibly to lure away Russia’s brightest and best software developers. Russia’s burgeoning Internet market – fueled by 50.8 million users at latest count – has quickly become a key target for international players, as online revenues are now rising at an impressive 30 percent a year. Russia’s overall retail turnover is growing at 7.2 percent annually, but within that figure e-commerce is now growing at two or three times that pace, having seriously taken off in 2010. In 2011, Russia saw a total of $17.8 billion in Internet-related sales, expenditures and payments, according to a new report by the Russian Association of Electronic Communications and Moscow’s Higher School of Economics. By far the largest revenues are in online retail, with nearly $10 billion worth of goods bought online, excluding travel deals, and online payment systems and terminals, which garnered $5.4 billion last year. Also growing fast are the revenues for contextual and banner ads, and marketing on social media websites. “In 2007 online advertising was worth $420 million, but by 2011 that had grown to almost $1.4 billion - up 287 percent,” says Svetlana Korobova, marketing director at I-media. With traditional bricks and mortar retail still a work in progress – particularly in the far flung regions that stretch over 11 time zones – Russia is ideally suited to e-commerce. Russia’s own Internet billionaires are eager to keep their Western rivals at bay, with users of local social networking site VKontakte and search engine Yandex outstripping Facebook and Google by four or five to one, respectively. The article is published in the RBTH minthly supplement to the Wall-Street Journal - Russian Business Insight. Read more about the project.